We keep asking this question again and again: Why do people volunteer? I decided to study the needs people have and tried to figure out which ones are satisfied when people volunteer. I pulled out Maslow’s hierarchy of needs, which looks like a pyramid with the largest and lowest levels of needs at the bottom, and the need for self-actualization at the top. 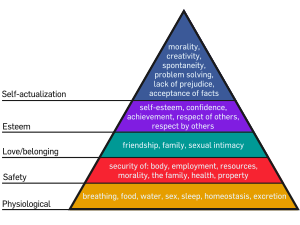 “The lower four layers of the pyramid contain what Maslow called “deficiency needs” or “d-needs”: esteem , friendship and love, security, and physical needs. With the exception of the lowest (physiological) needs, if these “deficiency needs” are not met, the body gives no physical indication but the individual feels anxious and tense”. Volunteering could help meet top four levels of needs, and there is something all four levels share – the need to be useful. Strangely enough, when we find a way to be useful, we find the meaning of life. Beatrice suddenly turned her back on the painting, walked out into the courtyard again. The idea she wanted to add to her book was straight in her mind now. The thought relaxed her. She lay down on Rumfoord’s old contour chair, looked up at the appallingly beautiful rings of Saturn — at Rumfoord’s Rainbow.